A cage for the uncontrollable beast that is the engine. 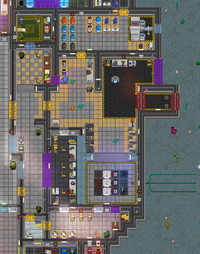 Engineering is the backbone of the station, containing the machines and supplies that keep the station from collapsing into a corpse littered derelict. It contains the thermo-electric generator and a variety of computers regulating power outflow to the station. The CE's office is in the far end of the sector. This is a relaxation room for the Engineers. It also features a bathroom with a medical cabinet in case they get some bruises working in such a dangerous environment. The main room contains three Engineer Lockers which contain many common engineering objects. This is the hot loop section of the engine. This area contains the four furnaces, and the combustion chamber. This area can commonly be found on fire with screaming engineers running from the interior of the room. This room contains the Thermo-Electric Generator (TEG) and the Power Transmission Laser (PTL). There are also four auxiliary ports you can connect canisters to. Like the hot loop, this area is commonly found aflame or exposed to hard vacuum. This is the cold loop room. If you haven't realized, its basically the opposite of the hot loop. It contains 4 freezers and an outer-space cooling line system. This room also contains the ABC-Us for copying entire room designs. This is the local emergency storage. It´s the sister storage to Emergency Storage B. It contains three engineering space suits with full gear, three firesuits with masks and air, four air canisters, three air scrubbers, and two breach carts next to two foam tanks. The Control Room is where all the fancy computers are kept in a nice air-conditioned environment. There is: A pump control computer, a general alert computer, an engine monitoring computer, two SMESs, a databank, and a DWAINE terminal. This is where the engineering staff keeps all the gas stored. There are six plasma canisters, four N2 canisters, three O2 canisters, and three CO2 canisters. There is also a dual-port mixing valve to make your crazy custom gas mixes. 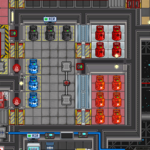 Engineering is the backbone of the station, containing the machines and supplies that keep the station from collapsing into a corpse littered derelict. It contains the thermo-electric generator and a variety of computers regulating power outflow to the station. It is adjacent to the mechanic's office and the CE's office. There's a pod bay and a conveyor belt in the north end for shipping out explorers and crates, respectively. The conveyor belt in the east end leads to the cargo bay, just in case they have something fun for you. 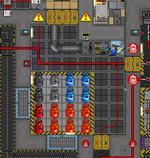 Engineering is the backbone of the station, containing the machines and supplies that keep the station from collapsing into a corpse littered derelict. It contains the thermo-electric generator and a variety of computers regulating power outflow to the station. The CE's office is eastward of here. This is where the engineering staff keeps all the gas stored. There are six plasma canisters, two N2 canisters, four O2 canisters, and two CO2 canisters. There are also two empty unmarked canisters for crazy custom gas mixes. The Control Room is where all the fancy computers are kept in a nice air-conditioned environment, protected by the safety-minded Klaus the GuardBuddy. 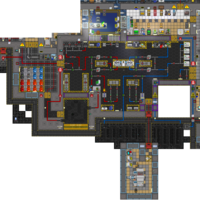 There is: A pump control computer, an engine monitoring computer, and a DWAINE terminal, as well as an array of lockers containing several common Engineering Objects and various materials and equipment for sealing hull breaches and fighting fires. 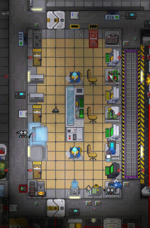 This is also the room where the fancy-schmancy shield generator is kept in case of meteor showers, and it controlled by the shield generator computer in the upper right. This highly disorienting labyrinth of pipes, valves, and meters is where the Thermo-Electric Generator (TEG) and its neighbors hot loop and cold loop live. Thankfully, most of the valves are conveniently labeled so that you don't accidentally route all the plasma to the combustion chamber and clog the entire cold loop while attempting to use cryo cooling. The hot loop section contains of 4 furnaces and the combustion chamber, connected by conveniently red-colored pipes. The cold loop section contains 4 freezers (for cooling gas, not ice cream) and outer-space cooling line system that uses the vacuum of space to cool down gases. There's also a radioisotope thermoelectric generator here, with a crate of RTG pellets nearby. It's a emergency generator of sorts, like the experimental local generator. On the NSS Clarion, the power transmission laser is so beloved that it gets its own little room, just a tiny space walk below the engine room. Here, an engineer can come here and sit back as the little thing charges up and fires off a laser beam off into the far beyond, watching the credits roll into their account. Engineering is where Engineers deliberately create a black hole and harvest the tiny virtual quantum particles escaping it to keep the lights on. Normally, they manage to keep it contained, but every so often, some greenhorn forgets to turn on the emitters before the field generators and accidentally releases the singularity, which then proceeds to leisurely amble about, eating everything that crosses its path and making the AI scamper in its chamber muttering about Law 3. Inner Engineering: Contains all the equipment and tools for the singularity engine and the little containment room for it. Every other room in Engineering branches off of it. Engineering Pod Bay: A rather cramped hangar with a single Industrial MiniPutt and racks of engineering space suits and jetpacks. Tends to be even more cramped when the singularity is loose. Furnace Room: An alcove directly west of Inner Engineering, filled with furnaces and crates of char for them. They're primarily used to generate power when the singularity engine is...nonfunctional. Power Room: A little den with all the SMES units for the engine, plus engine output and power monitoring computers. People tend to forget about setting the SMES units here veeery often. Engineering Tool Storage: A great big room just below Inner Engineering with various tools useful for people who work next to a black hole on a regular basis, like meson goggles, magboots and toolbelts. The tank dispenser here dispenses plasma tanks for the array collectors. Chief Engineer's Office: A nice little private office/bed-chamber for the Chief Engineer, who is apparently alright with sleeping next to a singularity. Contains their locker of mildly useful engineering stuff and a crate with an RCD and accompanying matter cartridges. There isn't a vent anywhere in this area. Better kept that containment area closed if you like your oxygen free and not in a can. The APC for Inner Engineering is near the Engine Master. The APC for the Engineering Pod Bay is on its southern wall, behind the rack. Furnace Room doesn't have an APC. Power Room's APC is on its southern wall, near the locker, while Engineering Tool Storage's APC is right next to the door into it, inside the room. The APC for the Chief Engineer's Office is also on its northern wall, opposite the little desk/table. Engineering is the one place on Mushroom Station where Engineers deliberately create a black hole and harvest the tiny virtual quantum particles escaping it to keep the lights on. Normally, they manage to keep it contained, but every so often, some greenhorn forgets to turn on the emitters before the field generators and accidentally releases the singularity, which then proceeds to leisurely amble amount and eat everything that crosses its path. Inner Engineering: The room that contains all the equipment and tools for the singularity engine and the little containment room for it. Furnace Room: An alcove branching off of Inner Engineering, filled with furnaces to be used in case the singularity engine isn't quite doing so well. SMES Room: A little den for all the SMES units for the engine. People tend to forget about setting the SMES units here veeery often. Engineering Tool Storage: A great big room just below Inner Engineering with various tools useful for people who work next to a black hole on a regular basis. Notable among them are engineering space suits and jetpacks, as well as Engineer's equipment lockers with mesons. Chief Engineer's Office: A tiny little chamber for the Chief Engineer. Contains their locker of mildy useful engineering stuff and a crate with an RCD and accompanying matter cartridges. The Mining Department is just outside the Engineering tool storage room, which is strange, because Miners usually don't have Engineering access. None of them are very happy about it. The APC for most of the rooms here is in the maintenance tunnel above. 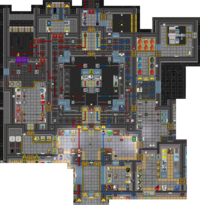 "Engineering": Actually just a locker/storage room that for storing, among other things, mesons, tanks of oxygen and plasma, and a backup generator. Engineering Storage: Another storage room off to the side of the locker, this time for firefighting equipment and raw construction materials. A looong, unnamed corridor that provides some well-deserved space between Inner Engineering and the rest of the station. Inner Engineering: The engine control room. In addition to housing the engine's array of radiation collectors, it also stores three sets of engineering space suits and jetpacks, so that the Engineers can weld and activate all the singularity engine components without having to hold their breath for a really long time or worrying about Space burns. Engineering is where Chiron's Engineers attempt to use all sorts of wacky atmospherics tricks to create a blazing-blue hell-inferno that's so hot it could theoretically break all the known binding forces between atomic subparticles and create quark-gluon plasma (good thing SS13 atoms are ridiculously strong). It's strategically located in the eastern parts of Chiron's central cave system, a bit south of Crew Quarters and right next door to the Refinery, and despite all the complicated thermodynamic and gas physics that often go on in there, the room itself is a pretty simple affair. 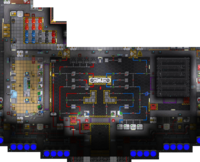 Inner Engineering: A bonsai engine of sorts, an entire thermo-electric generator, combustion chamber and all, crammed into a room roughly the size of the Bar. Gas Storage: All the plasma and oxygen used in the TEG is stored here, along side char for the furnaces. In the event Engineering manages to run out of either gas, there's a gas extractor for making extra canisters of gases. PTL Platform: In addition to housing the TEG's cold loop pipes, it also serves as a handy platform for the station's power transmission laser. SMES Room: An absolutely tiny room for storing the engine's absolutely massive power output. 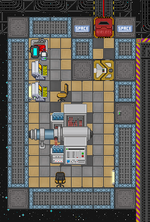 The SMES units here are unfortunately inaccessible from the main Engineering room; instead, you have to take a little spacewalk a little bit south and east of Refinery. Only the SMES Room has an APC, and it's right outside the door into it. Chief Engineer's Office: The home of the local Chief Engineer. Contains an RCD crate and locker with cool stuff like a MkII Aurora Belt. Power Room: Houses the capture system's three SMES units, bordered by yellow and black safety stripes so Traitors know exactly what's important-looking enough to bomb. Engineering Dock: A garage of sorts for the departmental minisub. Engineering Gas Storage: Stores canisters of, what do you know, gas. It also houses two tremendously useful fluid tanks and the station's local giant laser beam. Inner Engineering: On other stations, this would contain the actual engine, like a TEG unit or a singulo. On this one, it just contains random crap. One part has a vague "fire-fighting" thing going on; there's an extinguisher, foam tank, foam grenade,burn patches, and friendly GuardBuddy reminding you of safety compliance. But the other part has stuff like extra mechanical and electrical toolboxes, welding supplies, electrical supplies, engine output and power monitoring computers, and GPS units. Engineering Storage: Houses diving gear, Engineer equipment lockers, and, most importantly, the station's stash of bagels and southern cornbread. Bathroom: A tiny little restroom, with a single toilet and an misplaced, very lonely sponge. There isn't a vent anywhere in Engineering, though there are drains in the big airlock into the ocean and in the Power Room. The Hallway and Foyer share an APC, confusingly named "Engineering", located near the entrance into Engineering Gas Storage. Speaking of which, the APC for Engineering Gas Storage is a little bit right of the top left corner, in-between the canisters of plasma and air. 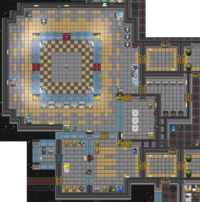 The APC for Inner Engineering is in its top right corner, while the one for the CE's Office is in its bottom left. 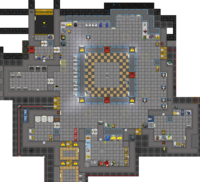 Similarly, the APC for the Power Room is in its bottom right corner. This page was last modified on 13 March 2019, at 21:04.